"It is said that Baqimba of the East was a collector before he turned evil and caused so much death and destruction. He is held as the example of ultimate failure that could befall any collector." The spirits of the dead are dangerous. They can only cause harm, and should be unified with the Great Spirit. That's done by spirit collectors, who entrap spirits within themselves or totems, carry them to ritual places, and cleanse them out. However, dead spirits constantly struggle for control, and so collectors are always at battle with them. Possessed collectors harness the power of all other spirits trapped within their bodies and are a force not to be trifled with. "Within the turmoil, the court's collector was cut deeply. I'll never forget his expression as he held the wound closed and swallowed the deadly poison capsule from his necklace, taking the spirits trapped within him into death - else, none would have walked out of the court alive." Every inch of a collector's body is room for more spirits. Spirits can escape through openings and ends of the body - mouth, hands, feet, etc. To make the collector's life easier, they are sealed with rings which also mark the extent to which the collector uses his body. Young collectors wear rings on the upper arms and forelegs, moving them further out with more experience. Collectors have great potential for being tragic figures. When they loose their concentration, all hell breaks loose. I wanted a profession that's instantly recognisable and causes both fear and awe in the general public. 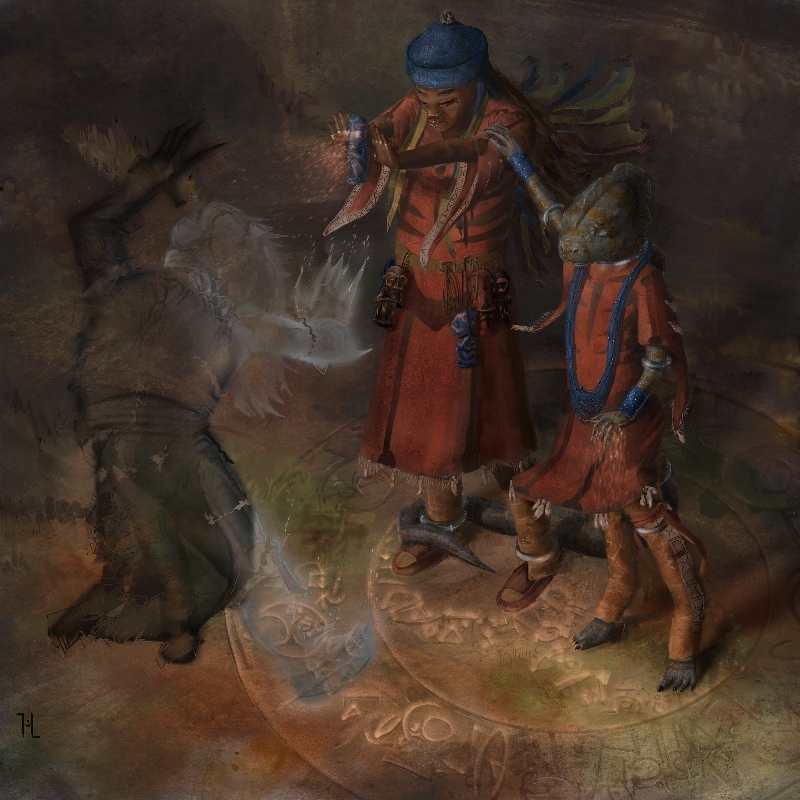 Plus, the shaman-inspired costumes are fun to design. I imagine there are lots of collectors in the world, trying to keep up with death as spirits pop up all over the place, trying to sort out the more dangerous first, and grouping together for larger rituals. There's a bit of exorcist/vampire hunter flair to them. It's Corvell from DeviantArt. I like this idea a lot, the idea of a spirit collector as well as a profession that's noble and awe-inspiring but dangerous. Hey there! Thanks. The collectors are always really cool to draw, because they have much of shamans about them, with the protective gear against possession.